The Church of Scientology is an inherently cinematic sort of modern bugaboo: a shadowy organization with a malevolent leader and thousands of brainwashed acolytes who infiltrate everyday society like pod people. 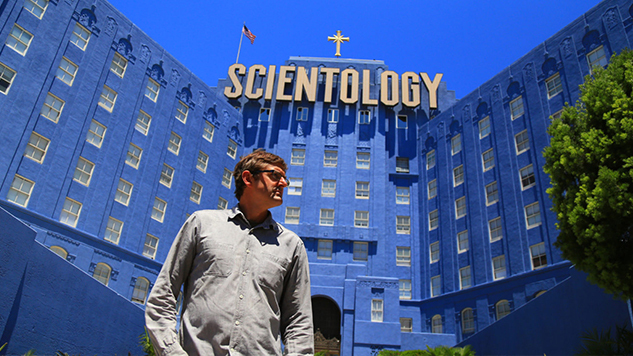 The Scientologists we see in new BBC-backed documentary My Scientology Movie seem barely real, more like the unblinking villains of a paranoid thriller or Cold War-era sci-fi movie than recognizable human beings. They’re a gift to a filmmaker looking for an easy antagonist, but—barred by a code of silence from revealing the inner workings of their church—they make for impossible subjects. It prevents British documentarian Louis Theroux from filming the type of documentary he’s long specialized in, where he spends quality time with society’s bogeymen—say, neo-Nazis or members of the Westboro Baptist Church—in order to find what makes them tick. The few occasions any actual Scientologists show up in My Scientology Movie, and they only ever appear to intimidate those involved in the making of the film, they won’t even offer a name when asked, as though all individuality has been scrubbed away. Unable to find active members willing to talk, Theroux and director John Dower instead deploy the Act of Killing technique of using dramatic re-enactments to draw some truth out of the only Scientology-affiliated people who are prepared to get involved in the film: those that have already left (or, perhaps more accurately, escaped from) the church. As Theroux and his cast and crew recreate key Scientology rituals and moments from the organization’s history, ex-Scientologists including Marc Headley and Tom De Vocht demonstrate their expertise, handily explaining the lingo and giving advice to the actors on how to play Tom Cruise and David Miscavige, Scientology’s current chairman. Marty Rathbun, a former enforcer of Miscavige’s, is Theroux’s star witness, a sad-eyed, unassuming man who’s quick to anger when challenged on his own complicity in some of the church’s murkier business, but all too happy to help Theroux portray Miscavige as a paranoid tyrant. The collaboration means we get to see what has before now only been anecdotal: “Miscavige” giving intense testimony in court, or assaulting errant church members inside what is effectively Scientology’s own squalid private prison camp. Otherwise, the film is Scientology 101: shots of ominous buildings which the documentary makers cannot enter, videos of the real Tom Cruise spouting his fundamentalist views, brief histories of Hubbard and Miscavige which depict “LRH” as a charlatan and Miscavige as a volatile dictator. As we see in the film, the church reacts to the perceived hostility of becoming the subject of yet another documentary by making legal threats, tailing Theroux’s car and harassing Marty, the “squirrel” (a traitor, in Scientology parlance). As they get wind of what Theroux is planning—perhaps there’s a mole, ponders Theroux, or maybe one of the “Tom Cruise” or “David Miscavige” auditionees tipped them off—the church sends its own crews to film Theroux’s documentary crew filming them. There’s not much here that won’t already be familiar to those who have caught the recent surfeit of documentaries and books on Scientology (not to mention Paul Thomas Anderson’s 2012 fiction film The Master, which more or less accurately dramatized the same Scientology techniques of interrogation, intimidation and “auditing” that Theroux and Dower recreate with actors here). Rather, the appeal of this never less-than-entertaining doc is Theroux. Little known in the US but a veritable institution in the UK, Louis Theroux has made his name on finding humor and humanity in horror. Always a drily inquisitive presence, he’s an owlish interrogator whose blunt, softly spoken manner both disarms his subjects and leads to some awkwardly amusing exchanges. Take the scene in this film where Theroux and his cast play-act at applauding an imaginary portrait of Hubbard on a studio set. Consultant Marty, visibly uncomfortable, begins to ramble about how it looks like Theroux is creating his own cult, at which point Theroux leads his actors in a round of applause with an ecstatic “Let’s give a hand to LRH!” As they drive away from the studio together, an increasingly frustrated Rathbun barks at Theroux to ask him a question he hasn’t asked him already. “What did it feel like punching Marc Headley?” Theroux replies, almost naively oblivious to the fact that Rathbun might be about to explode. My Scientology Movie isn’t particularly deep—Alex Gibney’s Going Clear comfortably remains the definitive film on this subject—but Theroux tackles what you might already know in a wryly compelling way. Theroux has always been most interested in exploring the quirks of people on the fringes, so he has a field day highlighting the bizarre, seemingly random practices and beliefs of the church. Naturally, this focus on the absurdities prohibits us from truly understanding why roughly 25,000 Americans, among them some of Hollywood’s most rich and powerful, continue to practice Scientology to this day. Theroux doesn’t do a great deal to explain. With zero access to his own subjects, how much insight could he possibly offer anyway?